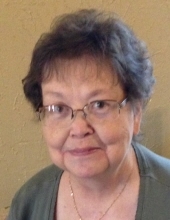 Beverly Ann Read, age 72, resident of Tonkawa, Oklahoma, passed away Thursday, July 6, 2017 in Oklahoma City. Friends and loved ones may pay their respects at the funeral home from 3-8pm Monday, July 10, 2017 with the family present to greet friends from 5-7pm. A ceremony to gratefully celebrate her time with us will be held at 10:00 am, Tuesday, July 11, 2017 at the Trout Funeral Home & Cremation Service of Tonkawa.. Following the ceremony, she will be laid to rest at the Winfield State Veterans Cemetery in Winfield, KS. Arrangements are under the direction of Trout Funeral Home & Cremation Service of Tonkawa. Beverly was born on June 15, 1945 to Harvey Allen Davidson and Nellie McMurtry Davidson in Bentonville, AR. Lester Allen Read became her husband on October 9, 1965 in Tulsa, OK. They made their life in Tulsa where she worked as an administrative assistant with an advertising agency, and later a computer company. Following Allen's retirement, they set off on a new journey to Tonkawa in 2004 with the purchase of Mary's Diner. The diner kept them busy for two years before Allen's mother became ill. His mother's care required much of Beverly and Allen's attention, so they sold the restaurant in 2006. Beverly's mind and hands were always busy. Whether it was reading a John Grisham novel or the other comfort mysteries from the library, crocheting, or quilting by hand, Beverly found peace in those quiet moments. However, she also had an adventurous streak. She and Allen embarked on travels across this great country with their trip to the Nascar races in Atlanta as a highlight. With Beverly refusing to be cooked in the sun to watch the race, they purchased a suite. The suite came with the perks of meeting some of the racers as well as getting a white knuckle ride along in one of the cars. When it came time to sit and watch TV, Beverly would root for the Thunder basketball team or watch hockey when she could. Survivors include her beloved husband Allen Read of the home, dear son David Read and wife Tiffaney of Amarillo, TX, treasured grandson Brendan Read of Oolagah, OK, adored sister Patsy Hunter of Claremore, OK and cherished sister in law Nancy Lea Murray and husband Fletcher of Los Angeles, CA as well as many friends. To send flowers or a remembrance gift to the family of Beverly Ann Read, please visit our Tribute Store. "Email Address" would like to share the life celebration of Beverly Ann Read. Click on the "link" to go to share a favorite memory or leave a condolence message for the family.